8:00 am on a January morning, and I’m bumping along the shores of Lake Atitlán on a ‘pic-op,’ surrounded by women in traditional garb carrying bundles of weavings to sell, babies on laps, a couple of young men with earbuds in their ears hanging onto the back of the truck. We’re on the way to Panajachel, where I’m meeting Jesús Toc and his brother. From there it’s into Jesús’ Toyota – a recent acquisition, very second-hand – and up the winding road to the state capital of Sololá and from there on to the sleepy little town of Chaquijyá. 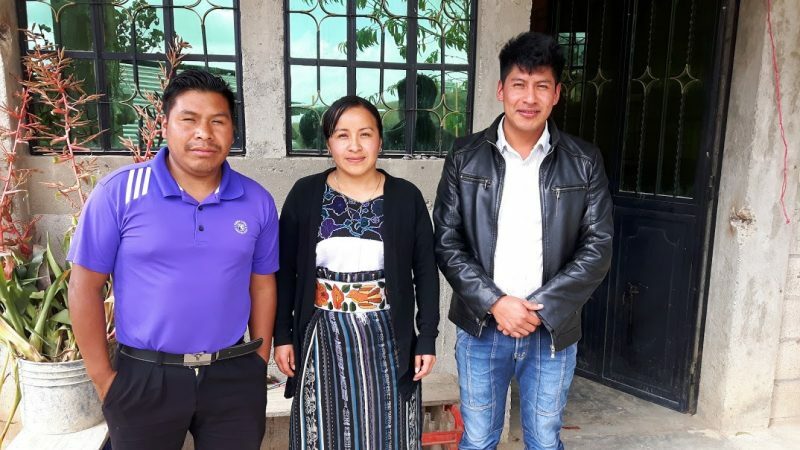 Jesús is the very committed volunteer administrator of the San Pedro Education initiative, Chaquijyá branch, which includes support for two secondary schools (junior and senior high), and a small scholarship program. 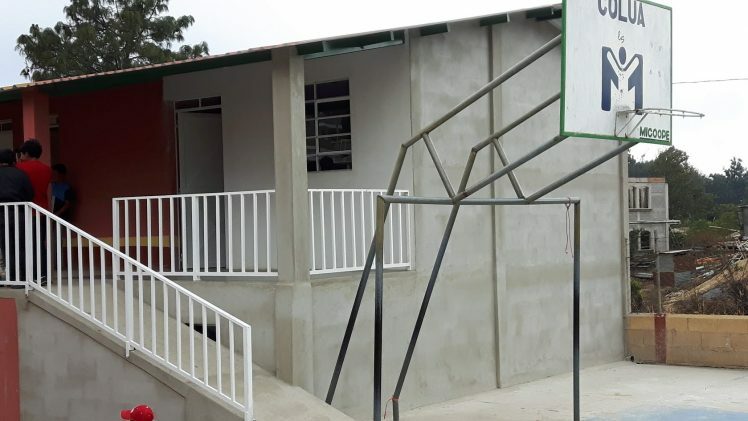 The state government provides next-to-no support for either of these schools, which were begun by determined committees of parents wanting post-primary education for their children. ICO Guatemala provides support for several part-time specialist teachers to supplement the teachers paid by the government. First to Nuevos Horizontes, the junior high serving 90 students, where I’m shown the 2-classroom extension that the parents have recently built in order to house the small collection of computers and sewing machines donated by ICO several years ago. ICO provided some of the materials, for this extension, the parents provided some materials and all the labour. I’m blown away by the professional appearance of the extension. What they need now, they explain, is more computers and sewing machines. Currently, there are 3 students to a machine, which is a hard and slow way to learn. Then on to the senior high school, with 45 students spread over 3 grades, meeting in the space vacated by the primary school that meets there in the morning. Victor, the intense young principal, proudly tells me that almost all of their students complete the final standardized government exams successfully, and that a recent national study placed this school in the top 4 secondary schools in their state, based on their exam results. Both of these schools operate with high pass rates due to the commitment of the staff. This year we used some of our scholarship funding to support three young teachers to go to the nearby university and take courses designed to help them improved their teaching methods and use new technology. Jorge, Alma and Eddie take classes twice a week. When they complete their year-long courses, they won’t receive a centavo more in salary; they’re studying because they really like teaching and want to improve. Most visitors, including me, arrive in San Pedro la Laguna by boat, across the often-choppy waters of Lake Atitlán. I get myself to the hotel and call Javier Navichoc, the volunteer administrator of this branch of the San Pedro program. Javier, like Jesús in Chaquijyá, is an incredible volunteer. Both of these men were scholarship students themselves, and intensely committed to helping Mayan students achieve their potential. This year, Javier has 7 becados (scholarship students). 3 in senior secondary and 4 in university. I meet with all except one, Rosalia, in 3rd year university studying to be a teacher, because she has a class on Sunday. 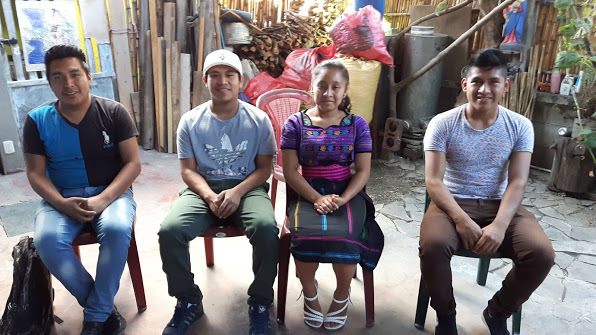 The students range from Juana, an orphan who is boarding with a family and studying to be a kindergarten teacher, to Josue, who is in his 3rd year of systems engineering and taking online courses on the side with the hopes of working for Google as a designer. What a great group of young adults! I left Guatemala feeling really proud of what we’ve been able to achieve in San Pedro and Chaquijyá – the difference we’ve made in the lives of well over 200 students and their families in the past few years. And feeling very grateful, as well, for the support from the donors who have helped make this possible.